This was absolutely delicious. Hubs raved about it. And it was SO easy! I’m cooking for two and a half people so I didn’t use very many pieces of chicken. You can easily double the amount of chicken (and bacon slices) with the same amount of soup and sour cream. 2. 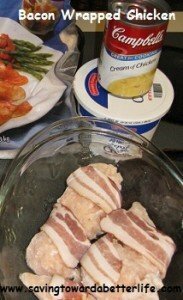 Mix cream of chicken soup and 1 cup of sour cream in a bowl and pour over chicken. 3. Cover with foil and bake at 350 degrees for 1-2 hours (depending on thickness of chicken). 4. Top with green onions before serving. Totally optional but it took the dish to a whole new level! I’m trying this today!! Thanks for this recipe. Previous post: e.l.f cosmetics: FREE Shipping and $5 gift card when you spend $15 – today only! Next post: Coupons for Christmas: My Little Pony, Baby Alive, Spider-Man, Sesame Street and more | Still Available!